Are you considering a house extension but are unaware of the process and costs involved? You’re in the right place. At Ecclesall Design we specialise in providing house extensions in Sheffield and the surrounding areas and have done for a number of years. Not only do we have extensive experience when it comes to house extensions, but we also boast a planning permission success record that is in excess of 99% so we’re confident we can help you achieve your desired extension goal, no matter how big or small. We also understand how small residential construction sites work and have direct hands-on experience of site management and dealing with trades people, suppliers, other professionals and builders. You probably won’t have built a house extension before therefore the process may seem overwhelming, confusing and stressful. We’re here to help. From the first phone call or email contact we will do our best to take the worry from you, provide you with clear and informative answers to your questions and transparency of the potential cost of a house extension. This applies when it’s a new structure built to increase the size of the property and give amazing new open plan living space and more bedrooms and bathrooms upstairs as well as if you’re wanting a loft conversion to add an extra bedroom with an ensuite or even just a garage or basement conversion for your growing family. Present a range of architectural drawings for your house extension. Allow you to make any amendments to the proposed extension designs. Obtain the appropriate paperwork from planning on your behalf, providing your project is permitted development or requires planning permission. Provide the technical extension drawings and building regulation details so building control approve the project – We even offer a project management service to supervise the build and make sure the finished project is exactly what you’d hoped for. Don’t own the property yet? It’s not a problem; we’ve been engaged on a number of occasions when the house purchase hasn’t yet completed. Starting your house extension plans early is a great idea as it speeds up the process and ensures internal remodelling is already prepared by the time you move in. The fee we quote for our services depends on the size and complexity of the existing property as well as the intended house extension plans or other works. We ask questions, carry out some research and then compile a detailed 10-page Service Proposal which sets out everything you need to know about engaging Ecclesall Design for your exciting house extension project. The Service Proposal sets out not only our fees but also other extension plan costs you are likely to incur. There’s more information about our pricing structure here. It’s important to us that our clients understand exactly what needs to happen, how much each stage will cost and approximately how much time it will take. You’ll find us transparent and easy to understand. We give you an idea of the other professionals who might need to be involved, such as structural engineers and energy assessors. We offer a choice of architectural extension drawing types in our Service Proposal as either 3D modelling or 2D line drawings. The 3D drawings are really helpful for complex projects or where the client wants to be sure they choose the best option by being able to visualise how the finished extension will look and feel. The 2D service is more suitable for standard projects where the house extension parameters are clearly defined and it’s either not possible or not required to explore different options. Saying that, the 3D images are certainly worth choosing if you’d like to get a real life appreciation for the new house extension before proceeding. There’s more information about the difference between the 3D and 2D services here. Our Service Proposal provides a lot of information about the whole house extension project process. It includes house extension costs not only for the architectural design drawings but also for the technical drawings and specification details that your builder will need to make sure he builds to current Building Regulations standards. We set out clearly any Planning or Building Control costs that will be payable to the local council in addition to our fees. We can give an indication of the costs of other professionals who might be needed such as structural engineers, tree experts, topographical surveyors, party wall surveyors and energy assessors. Our first visit after being engaged would be to survey the whole property from top to bottom and take measurements and photographs to enable accurate scaled drawings to be drawn up. 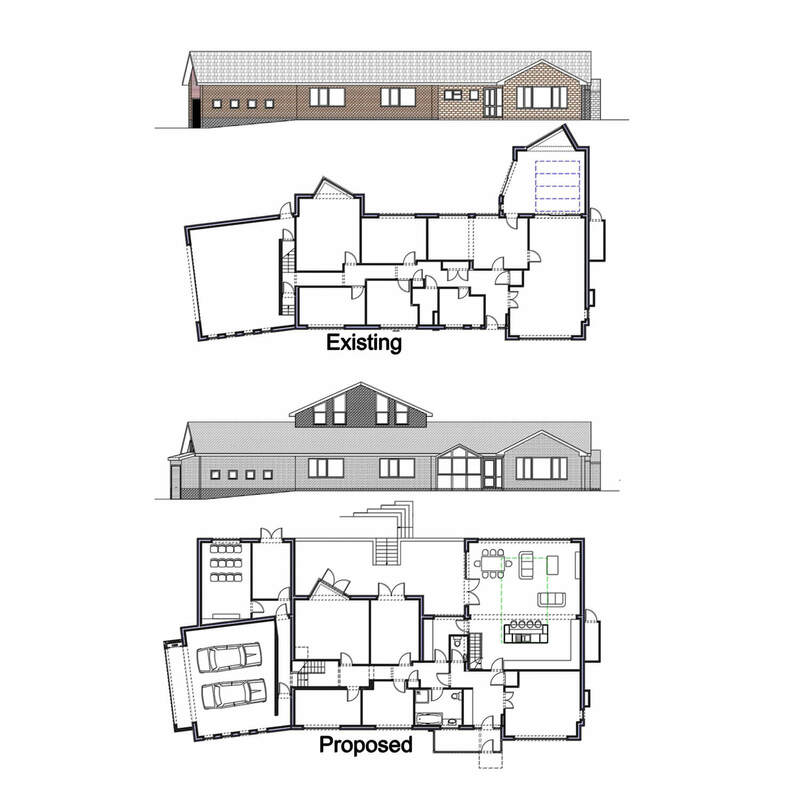 Even for a small house extension or a garage/basement/loft conversion we need to produce a full set of existing and proposed plans and elevations as well as a site plan and location plan. This allows Planning and Building Control to understand the extent and detail of the proposed alterations/works. This meeting gives us the opportunity to meet you and hear about your lifestyle, how you and your family use the rooms you currently have and how you would like to use the new areas in the future. We are interested in your ideas and lifestyle, especially an indication of style or design that you’re not keen on or that you love. This will help us establish a clear extension design brief. Sometimes it is necessary to engage specialists such as a topographical surveyor who would provide evidence of the exact physical boundary location, heights and positions of key surrounding features or differing ground levels. If there is a tree in the way of a proposed house extension the local planning authority would usually have no problem but on occasions a tree specialist will be needed to provide an expert report. Both situations would be unusual and we will be able to advise when we see you. Your reasons and needs for the house extension or conversion project combined with our architectural insight and our professional expertise enables us to provide a range of exciting house extension design options to give you ideas for how to use your new space. We show designs that use the ideas you have and also come up with alternative proposals including thought-provoking remodelling of the existing house. During the presentation meeting we share points of view and discuss the pros and cons of each option so you make an informed choice. Creating the initial set of extension drawings takes longer than making amendments later in the process as we have to draw the existing and proposed sets of drawings from scratch using the measurements and photos we took on the survey visit, whereas revisions are always carried out relatively quickly as the bulk of the work is already done. The drawings will be in either 3D or 2D, depending on the service you choose. For the 3D modelling service we produce an extensive range of drawings that include cross sections and 3D views. For the line drawing service (2D) we produce a set of existing and proposed plans and elevations as well as, for both services, the additional drawings that are needed for Planning and Building Control purposes. The drawings we present are informed by current Planning and Building Regulations legislation. We have an excellent relationship with planning officers and local building inspectors and talk frequently with the various organisations to check a detail or agree a way forward. Once the initial set of drawings is complete we arrange a presentation meeting to suit yourselves and your family. This visit can easily take a couple of hours while you ask questions and we all discuss the various options on the table so it’s good to leave plenty of time for this. We recommend we carry out the presentation meeting at your home rather than at our offices so we can nip out to look at something if a query arises. It’s at the presentation meeting that the real benefit of the 3D service can be seen. We bring printed drawings to leave with you on large sheets and we also show you the 3D modelling on computer so you can look at the proposed house extension and internal alterations from different viewpoints. If you’ve chosen the 2D service we bring a full set of printed line drawings to discuss and leave with you. Many people are quite content with the 2D line drawings – indeed, it’s all a lot of architects offer – and we have drawn a large number of projects using this method. Our meetings are often dynamic with us sketching out ideas to illustrate a certain point as the conversation flows. With the 3D service we can make real-time revisions to the onscreen drawings in front of you so the impact of the suggested amendments can be seen immediately. With the 2D line drawing service we would tend to make notes and send the revised drawings within a few days of the meeting. Our presentation will include a careful selection of photographs to illustrate key architectural and interior design concepts. Before the meeting we put together an assortment of images so you get a real feel for our vision for your new house extension, and we also show examples of alternative construction design or materials and discuss the differences between them. A well-designed house extension is more than a means to provide you with additional bedrooms or a large kitchen; it will also add value to the property and increase its saleability when the time comes. We want you to feel proud of the quality of your house extension due to well-chosen products, materials and inspired design. Following the presentation meeting we carry out further amendments to the drawings which we will send to you for your approval and comments. There is no extra charge for revisions as we want you to be completely happy with the extension design you choose for your project. If we feel that pre-application input would be useful from the local planning authority we would make the application on your behalf at this point. We sometimes consult with Planning, Building Control and suppliers to clarify the specification of particular materials or products which could include doors, windows and roof lights, roof tiles or other coverings, bricks, render, wall cladding or exterior patio finishes. We put together the results of this research and report back with further information and samples when appropriate so our client can make an informed choice. Once it looks as if we have agreed on the layout and designs – or are nearly there – we set a date for the design visit. This provides the opportunity to fine tune the drawings prior to finalisation and decide upon the key architectural design points that will make a real different to the finished house extension project. We also give advice about interior design features such as furniture layout, wall and floor materials/texture and colours and lighting. The final drawings such as the site and location plans will be prepared as soon as the architectural extension design drawings are signed off, ready for submission to Planning. There are various aspects to Planning that are important when it comes to any house extension project including pre-application advice, planning permission and permitted development. We are greatly in favour of making a pre-application enquiry prior to making the formal planning application or before coming to a decision that a project is definitely permitted development. The local planning authorities all very much encourage pre-application enquiries and this is the recommended procedure by the UK government. It enables any issues to be discussed and dealt with, and there is time to negotiate and agree solutions with a planning officer before the application is made public and sent to neighbours. We have virtually 100% success record in achieving planning permission for our clients. That is an outstanding achievement and one we are very proud of. It is due to a combination of our professional knowledge and experience in dealing with planning legislation and in our willingness to engage with the local planning authority rather than waste our clients’ money in making planning applications that will be refused. Once we have received the support of the allocated planning officer we submit the planning application and then await the statutory 8 weeks for the planning notice. Permitted development legislation is renowned for being complicated. Even planning inspectors deciding appeals against local planning authorities’ decisions arrive at verdicts that conflict on very similar evidence. We always recommend to our clients that we apply for a Lawful Development Certificate on their behalf as this then confirms to prospective purchasers that the work was permitted and did not need planning permission. A certificate also means that there is confirmation that the extension work is lawful before construction work commences. In all our dealings with the local planning authority we will act as your agent and negotiate on your behalf. Once you have either a lawful development certificate or planning permission you’ll need to be thinking about building regulation approval from Sheffield Building Control or whichever building control department is relevant for your particular area. Building regulations are minimum standards for any house extension design, construction and alterations to virtually every building. The regulations are developed by the UK government and approved by Parliament. We provide you with the technical architectural drawings including section drawings and a full materials and method specification to ensure your builder knows what to do to comply with current building regulations. As we are a partner agent with Sheffield Building Control their building inspectors check the details we submit for all our clients’ projects, including for fire safety, send the drainage drawing to the local water authority for their approval and then issue a list of structural calculations that a structural engineer will need to provide. If the amount of new glazing exceeds the permissible level you will need to supply SAP calcs; we can recommend an energy assessor who will sort this out for you. Sheffield Building Control will also advise you of the cost of inspecting the building work once construction commences which leads to a completion certificate to confirm that all work was carried out in compliance with building regulations. If you live in a different area you will be contacted by the relevant local authority building control department who will provide details of their services. We offer a project management service to oversee your house extension project to make sure that the end result is what you expected and that no key design feature is forgotten in the construction process. Our clients spend a lot of time fine-tuning the drawings and it is important that this attention to detail is not lost once building work starts. It can be tempting for a builder to offer an alternative product or material; we act on behalf of our client and keep an eye on what’s happening on site. We assist in comparing quotes from builders and will arrange for previous work to be seen so our clients make an informed choice. Thank you for reading our house extensions page; we hope you’ve found it helpful and that you have more insight into the process. We would be delighted to hear from you. Please do check out the reviews and our portfolio. 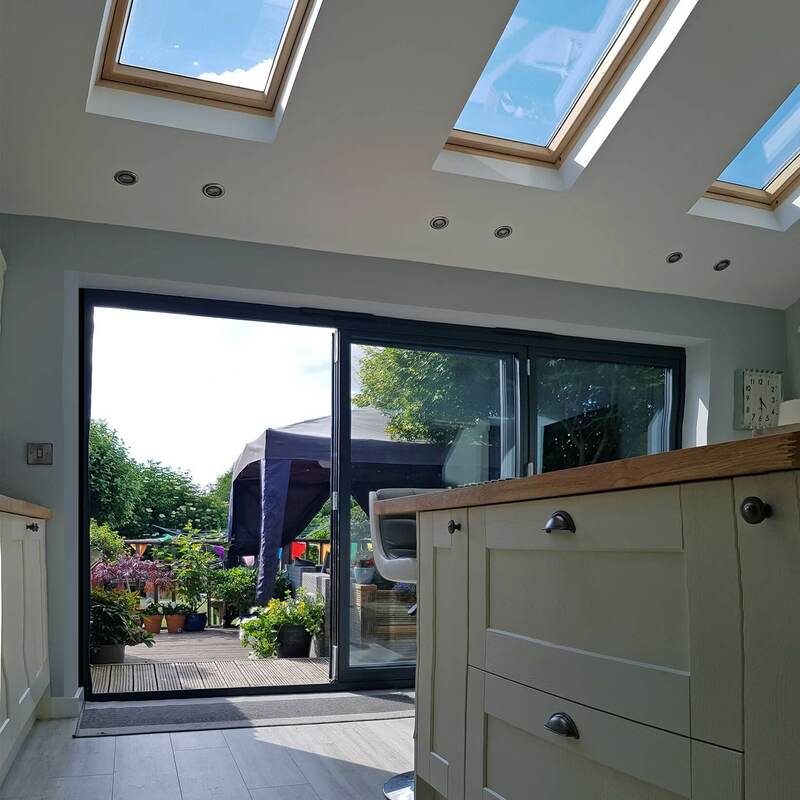 We have drawn literally hundreds of house extensions, loft conversions, garage conversions and basements and there isn’t room for everything – we’ve tried to pick out interesting projects that show a range of our work. We start from scratch with each project not only because each property is unique but also because everyone wants something slightly different from their house extension and remodelling. This is why we listen carefully and then provide creative extension design solutions. Each process as set out on this page involves quite a few steps. We’ll lead you through it and even though it seems complicated you can trust us to take the stress away from you. We have a huge amount of experience and professional expertise that we use on your behalf whether we’re dealing with Planning, Building Control, suppliers, builders or other professionals. We would love to hear from you. Whether you know exactly what you want or you need a range of inspirational ideas, if you’ve built an house extension before or haven’t a clue how to start, we’re there for you and are ready to share our knowledge with you. We’ll support you every bit of the way. Why not give us a ring now?